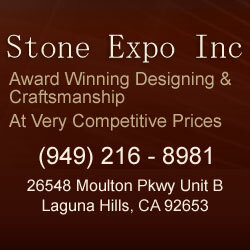 Stone Expo Inc. is a licensed and insured kitchen and bath remodeling contractor, serving Orange County since 2001. We specialize in kitchen, bath, fireplace, floor, and outdoor living area renovation, and offer award-winning design and superior craftsmanship at affordable prices. Stop by our showroom today to view our vast selection of granite, marble, and flooring choices.